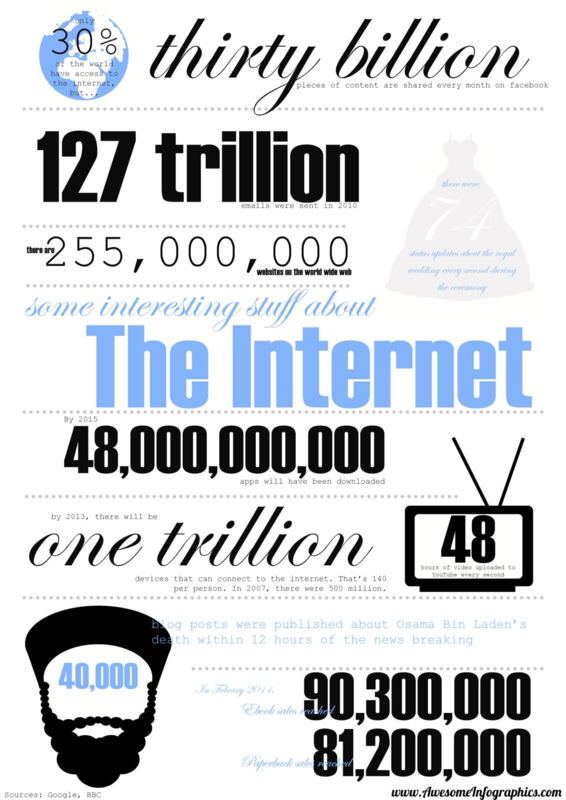 Today we would like to share some interesting stuff about the internet infographic. As the internet continues to explode and grow around the globe the interesting facts will continue to change. In an effort to predict the changes that will occur during the explosive growth of this unparalleled medium, we will share some of the current statistics and project them over time. Thirty billion pieces of content are shared every month on facebook. 127 trillion emails were sent in 2010. There are 255,000,000 websites on the world wide web. There 74 status updates about the royal wedding every second during the ceremony. By 2015 48,000,000,000 apps will be downloaded. By 2013, there will be one trillion devices that can connect to the internet. That is 140 per person. in 2007, there were 500 million. There are 48 hours of video uploaded to YouTube every second. 40,000 blog posts were published about Osama Bin Laden’s death within 12 hours of the news breaking. In February 2011, ebook sales reached 90,300,000. Paperback sales reached 81,200,000. As you read through this interesting stuff about the internet, you can see that the statistics can be downright overwhelming and the attributed facts can compel one to wonder if they are in fact true. As time progresses, we can continually check these facts and confirm or deny their inherent truthfullness and continue to make projections based on the facts presented in the above awesome infographic. These facts are met with awe and inspiration and one can only wonder about the astronomical facts and statistics that await the world in light of the incredible growth of the world wide web. These statistics are truly amazing and we can only wonder what interesting stuff about the internet we will learn in the coming years. We hope you have enjoyed our interesting stuff about the internet infographic.